Hot Lap is AmericanMuscle’s monthly video capturing the hottest news in the Mustang World, spanning many Mustang generations and communities. We cover everything from the sickest Mustangs around, new parts that we carry, parts we are giving away, news from Ford, and everything in between. This month’s Hot Lap covers Stephanie getting her NHRA License, some new parts from MMD, a 1995 Cobra Build, and some 2018 Mustang news. On this episode of Hot Lap, Justin takes our 850+ HP giveaway Mustang down the 1/4 mile, a ’16 GT gets some show and go mods and of course, we review some new parts! Hot Lap: First Drive of the 2015 Shelby GT, 2017 Mustang News, & More! 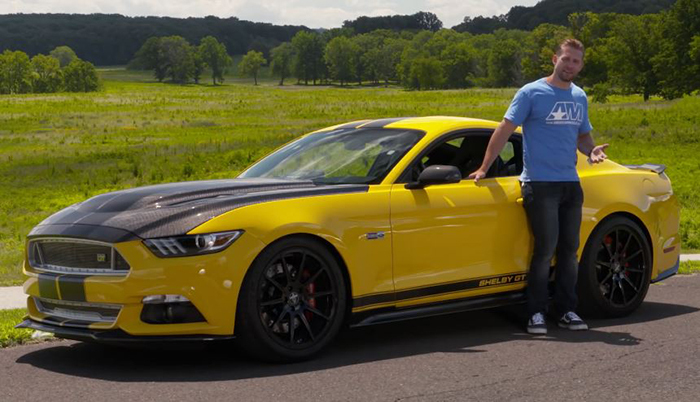 On this month’s Hot Lap, Justin takes the brand new 2015 Shelby GT for a test drive, we get some new news on the future of the Mustang, and a glimpse at some awesome products! Get a peak inside the inner workings of the Maganflow factory as well as some Mustang industry news in this episode of Hot Lap! Professional Drifter Vaughn Gittin Jr. joins us for this month’s special edition of Hor Lap, and looks closely at all things RTR! Hot Lap: New Parts, The Latest Mustang News, and Cobra Jet Tuning! This month’s Hot Lap covers a great new product from Raxiom for 05-09 Mustang owners, new wheel selections, Cobra Jet Intake tuning, and more! In the last Hot Lap video of 2014, Justin and Stephanie take a look back at some of their favorite moments of the 2014! The final Hot Lap video of the year delivers some unseen footage from the top Mustang events of 2014, new products, and a blooper reel that is sure to have you laughing. Hot Lap: Project Fox Body, 2015 Mustang News and Giveaways, New Products and More! The October Hot Lap video hits the track with Project Fox Body in search of 10’s, checks out new parts and giveaways, and gives you and inside peak at the 2015 AmericanMuscle Calendar! This month’s Hot Lap goes behind the scenes at #am2014, shows you some awesome customer rides, Justin’s project build, and more!